It has been a lazy Sunday for me today. In the mad rush of my life, sometimes it’s just nice to have a day off to do not a whole lot and to forget the mountain of work I have yet ahead of me in the next week. Most of the week I am logged into the Second Life world, trying to get my installation done for my project that is due for the end of semester. I will be projecting my Second Life installation live in the gallery at the university and in order for that to happen, there are so many things to think about at any time that my lists are overwhelming. So, I hopped in world, ignored my installation, and took a few hours to hang with my friend and hop over to some of the events I had been meaning to see. Sometimes I just like wandering through them and looking at the beautiful work of the event creators. The Spoonful of Sugar sim, which I talked about in the latest episode of Coffee Break is one such place that was just a joy to walk around. It’s such a great event filled with generous creators who give of their time and money to help support the incredible Medicins sans Frontiers charity. Be warned though, if you go…this event is HUGE so be prepared to walk a LOT. It covers four whole sims but has lots of fall shopping opportunities and raffles and it is all decorated perfectly for fall. I have to say, I love the charitable nature of what happens in Second Life, but I guess a minor criticism I have is that a lot of the big name creators are missing. Now I KNOW they are really busy and have a full on schedule and that there are SO many charity events that happen throughout the year…but the absence is notable and makes me a bit sad I guess. That’s really all I have to say about that because I respect and admire the creators of SecondLife, great and small, and the very essence of GIVING is in not HAVING to give, but choosing to. 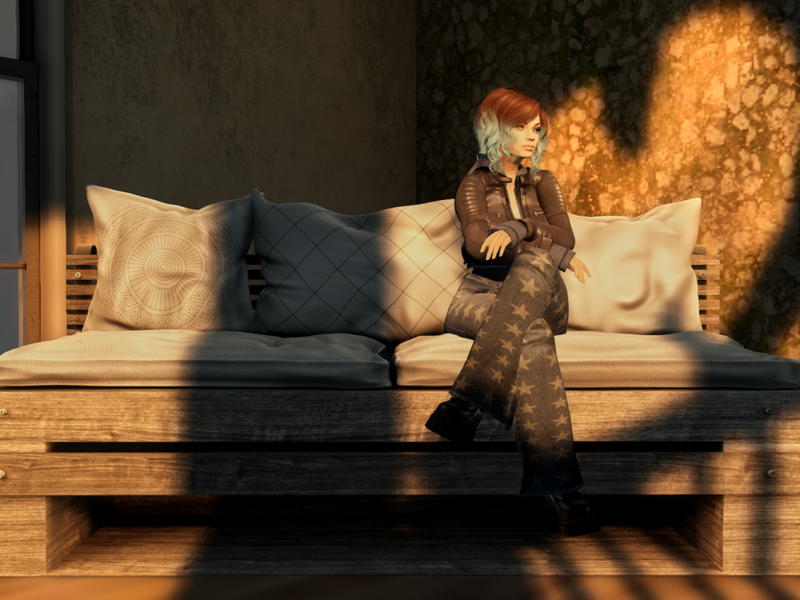 I popped on over to the new Inspiration event (Thank you SL Blogger group for the early access!!!) which is all about Cher: Leather and Lace and my gosh it did NOT disappoint on that front. You will see a lot of black leather and I really loved how they did the sim up in a really theatrical just about to see a band at a concert sort of way with the fog and the lights and the punk chain wire fences. The creators did a fantastic job of keeping to the theme, which really added to the ambience (mmmhmmm I just said that in that really snooty nasally way so you need to as well!). After event hopping the afternoon away, I took Alicia back to my new still looks like it is half built and not set up yet home so we could…well…in all honesty, sit around and chat and laugh. I kid you not when I say when we have time to to do this, I end up in tears and choking with laughter. Sometimes, when you least expect it, you just click with a person and they make your life BETTER. They make you feel like things are going to be okay and if they aren’t, well…they will help you forget that for awhile and make you laugh until you cry. And online or offline, that friendship becomes a real thing and in months like these that are filled with self doubt and anxiety, I am so very grateful for the friendships and the laughter. And lastly I ended the day at one of my favourite places. One with such a rich and inspiring history in Second Life that it makes me smile and fills me with hope. It’s presence here urges me on when I feel like I am banging my head against the walls in frustration and I am so stressed and anxious with my own creative output that I don’t think I will make it through my studies. It reminds me that there IS a way…that we CAN and that if I can dream it, it will be. Sometimes I come here to sit or walk quietly and remember how far I have come and that I can reach further still, even when it seems like the horizon is looming, there is still quite a journey ahead. It was, of course, the University of Western Australia. I visited the Transformations exhibit (again!!! I have been here MANY times) and I wandered the campus. I felt renewed and refreshed. As I sat on the lawn, I felt…calm. There are days when I feel obsessed and frantic, when I ignore the messages that come to me and just put my head down and work like a mad thing, absorbed in the chaotic swirl of thoughts in my own mind. But for just this moment, when the pressures of my worlds seemed very far away…I found peace in a Lazy Sunday.